Broadband internet is the alternative internet access to dial-up internet. It became popular during the 1990s. The definition of broadband internet has changed through the years, and currently equates to a download speed of at least 25Mbit/s and an upload speed of at least 3Mbit/s. The average upload and download speeds have progressed significantly. Although broadband is by far the most common type of internet access in the UK, even faster internet connections are already advancing, such as the fiber optic broadband networks, also known as superfast broadband (SFBB), which can deliver speeds of up to 300Mbit/s. Heavy investments are coming in from Broadband Delivery UK (BDUK) in order to provide a more widespread access to SFBB. This is not to say that internet consumers are not satisfied with their fixed broadband service. Although the satisfaction rate has been dropping over the years, it does still amount to 87 percent. 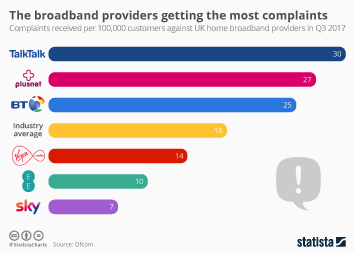 Satisfaction ratings for the four most common internet service providers in the UK differ, as seen when comparing Virgin Media, TalkTalk, and BT. Of course, the bottom line for telecommunications operators is to make revenue from their broadband retail business, which has been growing consistently over the years and stood at 5.1 billion British pounds in 2015. The broadband penetration rate in 2015 amounted to 80 percent. This added up to a total of 24.7 million broadband connections, 4.7 million of which were fixed cable broadband connections. Mobile broadband has not seen penetration rates as successful as fixed line, but there still approximately 5.6 million mobile broadband subscribers in the UK. BT has been expanding its SFBB coverage across the UK and has reached impressive levels in England, Scotland, and Wales. Virgin Media media lags behind BT but has also made progress in the same countries. More interesting topics from the industry "Data & Internet"